As part of this weeks ongoing Bridgnorth Music & Arts festival, it is Open Studios Night on Thursday 30th August from 6pm to 9pm. Giving people the chance to Visit the a participating artists in their studios, see them at work and chat to them in their natural environment. There is also plenty of great live music being played at various pubs around the town. 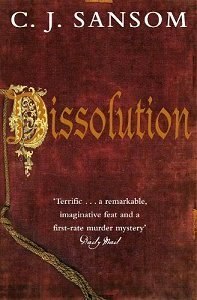 After my previous post about the forthcoming Television Adaptation of Wolf Hall by Hilary Mantel, I recently found about that BBC Radio 4 has also made A ten part adaptation of C. J. Sansom’s Tudor crime novel Dissolution, which is to be broadcast on BBC Radio 4 from Monday 3rd to Friday 10th September. Adapted for radio by Colin MacDonald and produced and directed by Kirsteen Cameron, it Stars Jason Watkins as Shardlake and Mark Bonnar as Cromwell. there will be two transmissions each day – one at 10.45am and one later on at 7.45pm. Having read plenty of C.J Sansom books I am really looking forward to it. Set during the Dissolution of the Monasteries, Henry VIII has proclaimed himself Supreme Head of the Church and the country is waking up to savage new laws, rigged trials and the greatest network of informers ever seen. Under the order of Thomas Cromwell, a team of commissioners is sent through the country to investigate the monasteries. There can only be one outcome: the monasteries are to be dissolved. But on the Sussex coast, at the monastery of Scarnsea, events have spiralled out of control. Cromwell’s Commissioner Robin Singleton, has been found dead, his head severed from his body. His horrific murder is accompanied by equally sinister acts of sacrilege – a black cockerel sacrificed on the alter, and the disappearance of Scarnsea’s Great Relic. So a lawyer and long-time supporter of Reform, named Dr Matthew Shardlake, has been sent by Thomas Cromwell into this atmosphere of treachery and death. But his investigation soon forces him to question everything he hears, and everything that he intrinsically believes . . . This year Emma was joined by Birmingham’s Young Poet Laureate in 2007/8, Matt Windle, who is Known as “The poet with punch”, and uses his poetry with people all over the country in schools, libraries, prisons, foster homes, young offenders etc. He was also an Olympic Torchbearer for 2012 and is currently Birmingham’s Featherweight boxing champion. Local poet and retired teacher Paul Francis who performed to huge applause in 2011, also made his way back from the distant lands of Much Wenlock for this years event. Paul keeps sane by writing different kinds of poems…comic, serious, rhymed, regular and political. Fergus McGonigal brought his rapid and animated slam-winning poetry to Bridgnorth Music and Arts Festival. With exasperation as his muse, he is on a mission to ‘share the despair’. In addition to the scheduled performances, there were also open mic slots which were included throughout the evening ranging from 1min – 3mins long The event finished at 9.15pm and raised money for Cameron’s Fund.